When we first heard about the Annual Downtown Tempe Brunch Crawl, we were thrilled! However, we realized there were a few restaurants we hadn’t been to! We felt that we needed to remedy this, so we headed down to Tempe to try a few. We decided that first we would have brunch at Caffe Boa. Now to be perfectly honest, we had never even heard of Caffe Boa. We didn’t know what to expect, but boy were we pleasantly surprised. Caffe Boa is just off of Mill Ave. and can’t be seen easily from the street. This is nice because it lends itself to a bit of solace from the craze of downtown Tempe. The menu has a focus on organic and local products with a Mediterranean influence. With the intention of a trying another restaurant in the area, we ordered a couple entrees thinking they’d be a bit smaller (we were wrong). 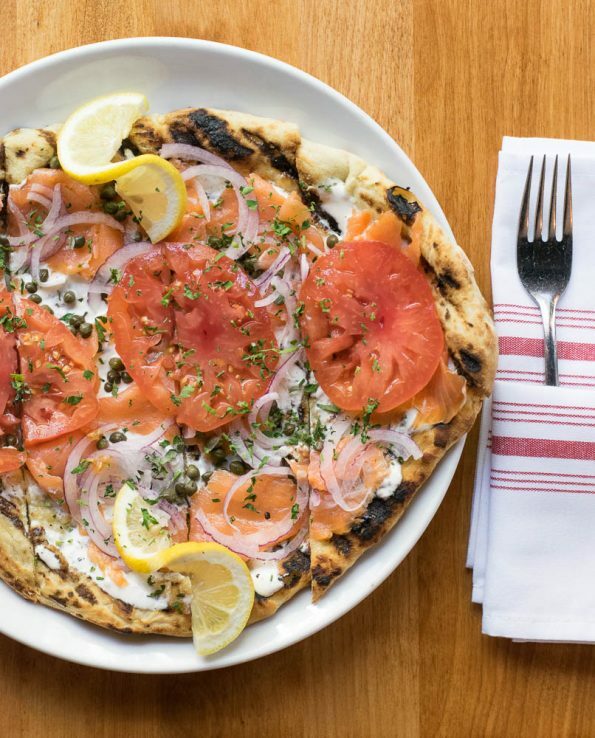 We ordered the Nova House Flatbread (smoked salmon, crème fraîche, heirloom tomatoes, capers, and red onion) and a Breakfast Bruschetta Board with an avocado, radish, sea salt, EVOO bruschetta, a honey truffle ricotta bruschetta, and a salmon mascarpone bruschetta. Both dishes were spectacular. The flatbread was served cool (intentionally) and tastes like a combination of a bagel and leftover pizza (not in a bad way). It has just the right amount of capers and the crème fraîche was an excellent addition. The bruschetta flavors we chose were the perfect breakfast choices. While all of them were fantastic, the avocado piece stole the show. The pairing of avocado with watermelon radish was spot on. The bite of the radish, the creaminess of the avocado and the course salt created a little piece of heaven in each bite. We were really impressed with our experience at Caffe Boa. The food and service were fantastic! 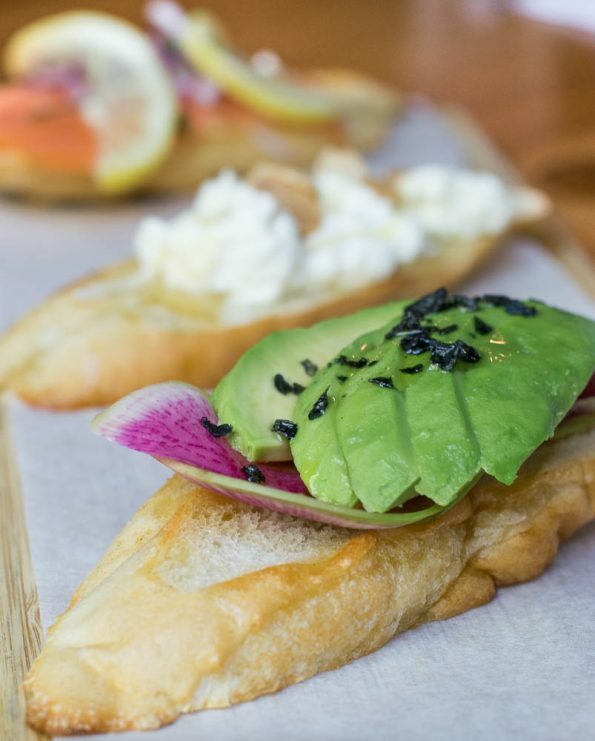 We really feel like we should be giving more attention to the food scene in Tempe. Where are some of your favorite places to dine in Tempe? We definitely want to know! Leave a comment below or use the hash tag #GeekEats! Caffe Boa serves brunch on weekends from 10am-3pm and is located at 398 S Mill Ave, Tempe, AZ 85281.